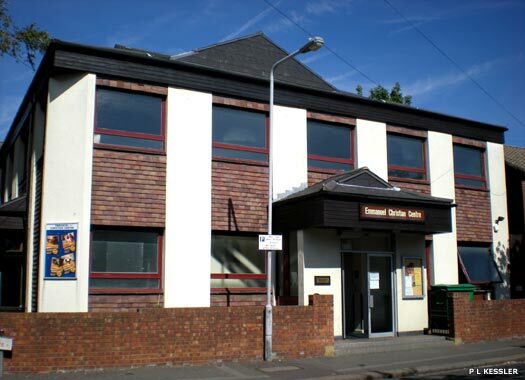 Emmanuel Christian Centre is on the corner of Erskine Road and Cottenham Road. 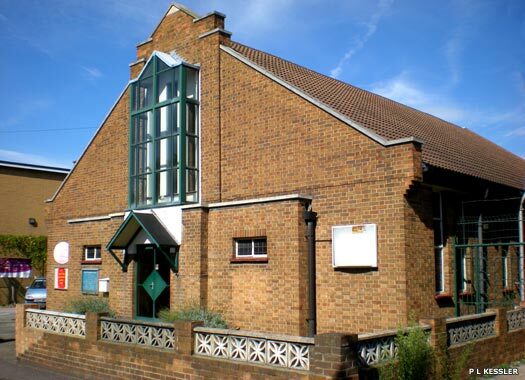 The Pentecostal Hall, Wood Street, was registered in 1926, but in the same year its members moved to Emmanuel Hall, Erskine Road, where services by the Pentecostal Church of the Assemblies of God were still being held in 1970. The church was given a noise abatement ban in 2009 which saw the congregation dwindle because it could no longer enjoy the singing. Quakers Greenleaf Road Hall is at 67-69 Greenleaf Road, on the corner of Melville Road, which leads from Erskine Road. Several Quakers lived in the parish in the late seventeenth century, and in 1779 one Lewis Weston of High Hall refused to pay his rates. Though such wealthy nineteenth century residents as John Gurney Fry of Hale End House, and Joseph Gurney Barclay of the Limes were Quakers, there was no meeting house in the parish until about 1870. In that year a small place of worship existed at Higham Hill, taken over by the Baptists in about 1888. In 1903 a mission hall opened in Greenleaf Road, while Friends' Hall, adjoining the mission hall, was opened in 1906. 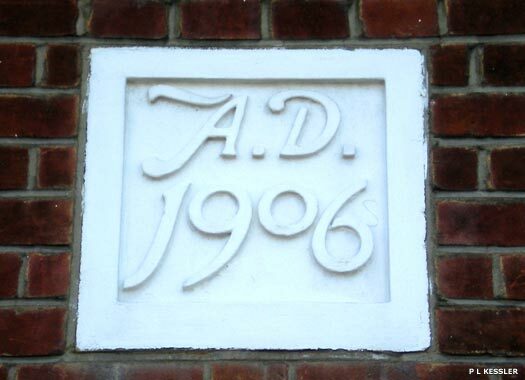 In 1921 the Walthamstow Educational settlement was established at the hall, which became a centre of educational and social work. An extension was opened in 1964, and the settlement is maintained jointly by the Friends and the borough council. The former Church of St Luke is further to the east on Greenleaf Road, on the north-western side of the junction with Brookdale Road. 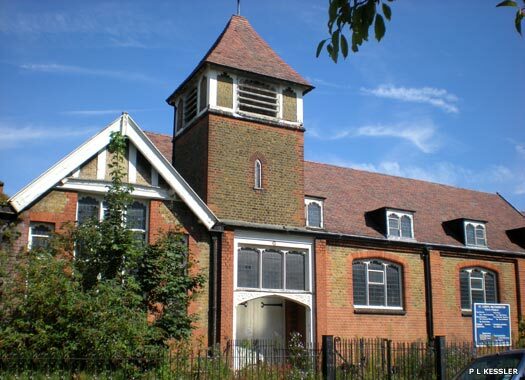 The church began its life between 1900-1901 when it served as a mission for the Church of St Mary in Walthamstow. Services were conducted in Greenleaf Road board school until a church room was built between 1901-1902, with the design being supplied by Bottle and Olley of Yarmouth. The church building itself followed in 1902. 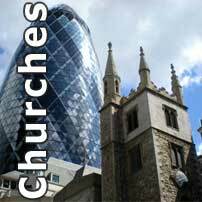 The church gained its own parish in 1903, taken from St Mary's and St John's parishes. The building is of brown and red brick with wood traceried windows and a small south tower. In 1923 the chancel was widened and new furnishings installed. By around the end of 2007, it was found that the cost of restoring the now dilapidated building was too high, so its doors closed. St Luke's now acts as a High Street mission church. No decision has been taken on the building's future. Greenleaf Road Baptist Church is further east of St Luke's, close to Hoe Street. It originated in 1902 in a tent mission sponsored by Church Hill Baptist Church. 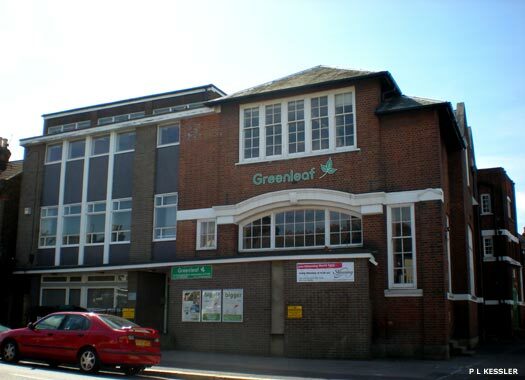 A group met in Hoe Street until 1903, when Forest Road Board School, Greenleaf Road, was hired. A church was formed in 1905 as the Central Baptist Hall, Greenleaf Road. This was enlarged in 1915 and reregistered as The Tabernacle, but it was destroyed by bombing in 1944. The present building opened in 1949. Friends Meeting House (Quakers) is on the southern side of Jewel Road just thirty metres (yards) west of Hoe Street. The group previously met in the Bedford Institute Association building (Greenleaf Road meeting house, above), but this Victorian print works was purchased in 1993. 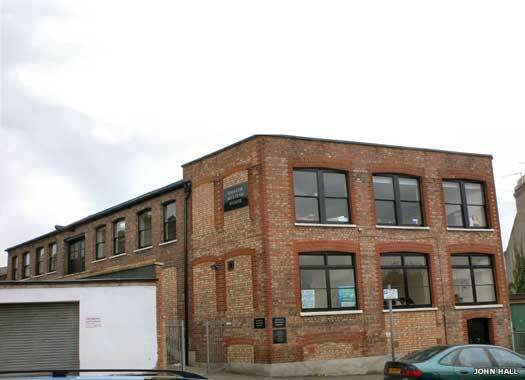 When used as a garment factory it had a frontage that extended flush with the pavement. The conversion was handled by architect Donald Insall, and the meeting house was first used in 1998. 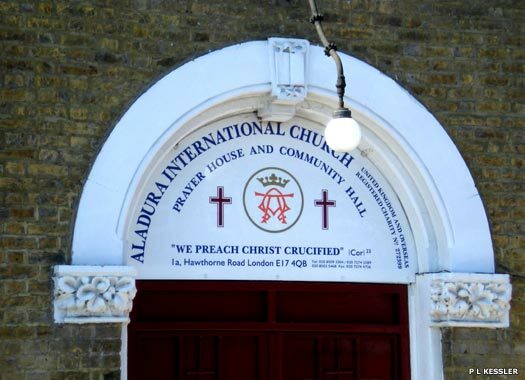 Aladura International Church is on the southern side of Hawthorne Road, a little way to the north of Greenleaf Road, and close to Hoe Street. 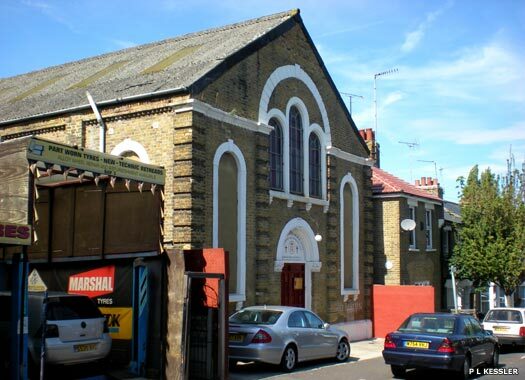 It began life as Hawthorne Road Primitive Methodist Church in 1880, when missionaries from the Marsh Street Mission held open air services on the Tower Hamlets estate in Walthamstow which lies just to the east of Hawthorne Road and Hoe Street. The current church was built in 1882 with financial aid from John Hitchman. 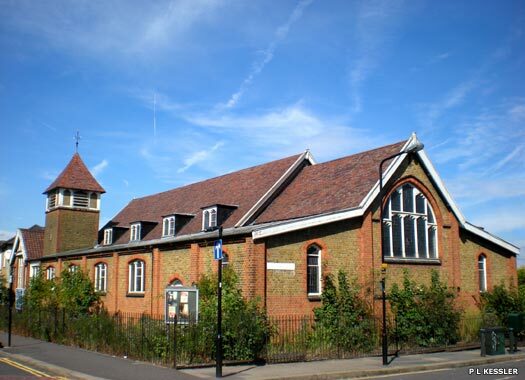 Unfortunately, the church closed by 1917, and was purchased in 1924 by St Luke's church as a parish hall. In 1964 the building was bought by the borough council for demolition, but it still existed in 1970 in use as a store. Thankfully, by 2008 it was an independent church again. It is a well-proportioned yellow-brick building designed in a 'classical' nonconformist style, with stone dressings and brick pilasters. A car repair centre abuts the building on its eastern side. Kingdom Hall of Jehovah's Witnesses lies a little way back on the eastern side of the extremely busy Hoe Street, just a few metres south of the junction with Forest Road. The building began as a Salvation Army Hall, but when they moved to their new building on Forest Road it became the Fiesta Co-operative Hall. 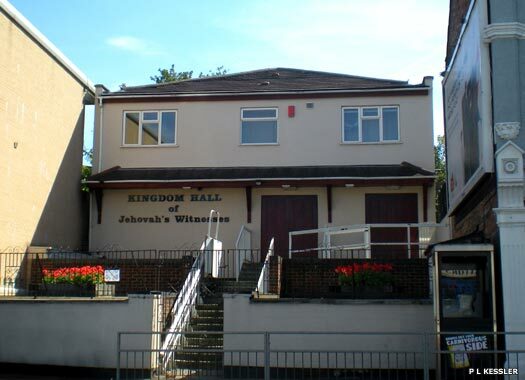 This in turn was sold to the Jehovah's Witnesses in 1962, and they registered it as Kingdom Hall in the following year, and remain there to this day. One photo on this page contributed by John Hall. Additional information provided by Arkady Rose.